Thei Zaza is originally from Greece and is a PhD candidate at the Aerospace Department at University of Bristol. What is your specific area of research? I am working on a fleet of autonomous unmanned aerial vehicles and I have designed different techniques to optimise their routes considering loitering and collision avoidance constraints. Mathematical modelling and software design have interested me from a very young age, as I come from an ‘Engineering’ family. What inspired you to leave home and come study in the UK? My brother’s courage and willing to study and succeed abroad have always fascinated me and inspired me. He has been my mentor my whole life, supporting me to achieve my goals since I can remember. And now, because of him, after 15 years since I first decided that I wanted to become a researcher in engineering, I am closer than ever to finish the hardest project I have ever been assigned. Any inspirational words to pass on to budding female engineers? Engineers do not have a gender. As long as you aim high, you will make it to the top! Dr. Orly Razgour is a NERC Advanced Research Fellow in the School of Biological Sciences. She sent us some images of her exotic research and discussed her mentors and heroines with us. I am a research fellow in Biological Sciences working on biodiversity conservation under global environmental change. I was always interested in understanding how the world around me works. I was inspired to work in science after travelling in Latin America and seeing first hand the incredible diversity of wildlife and the extent of human impact on the natural environment. My research has taken me around the world – catching bats across Europe, in the Amazon rainforest, Middle Eastern deserts and the Ethiopian Highlands. Throughout the way I have been inspired by many great and dedicated women scientists around me, but my greatest inspiration has been Emma Goldman, who inspired me to live my life and pursue what I believe is right. Read more about Dr. Razgour’s work. 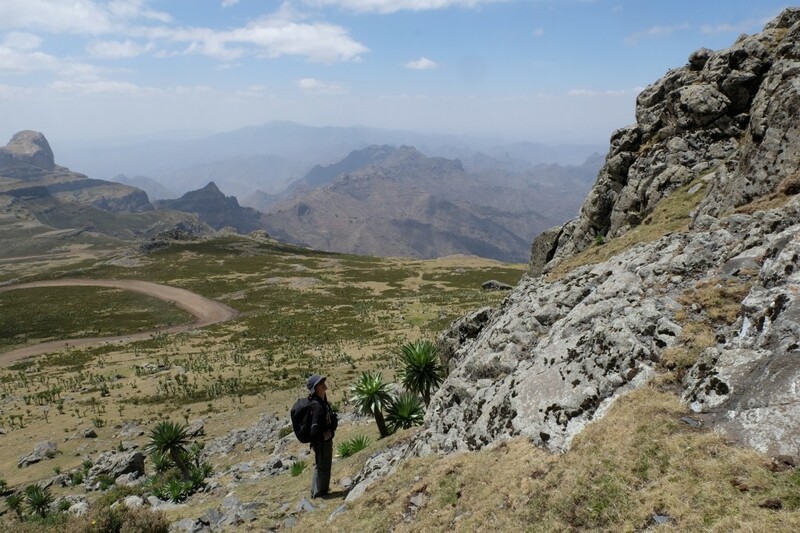 Dr. Razgour’s research with bats has taken her across the Ethiopian Highlands, 4000m above sea level. 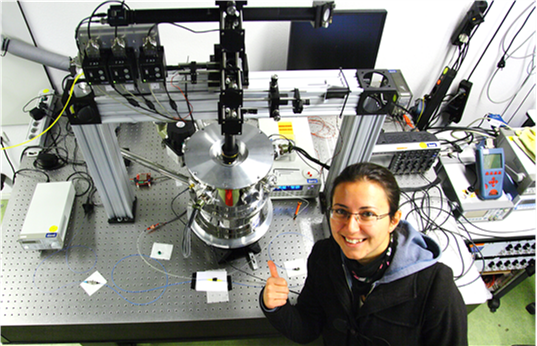 Dr. Döndü Sahin is a Postdoctoral Researcher in the Centre for Quantum Photonics. She spoke to us about how she ended up as a researcher, her curiosity as a child, and how her profession has opened up gateways to the greater world. Can you tell us about your specific area of research? When I am asked to explain my work to public, I usually make an analogy to internet-banking, as confidentiality affects people in their daily lives and so is relatable. Currently, for example, classical channels are used for the password transfers in internet banking. Therefore, when we log on to our internet banking we are given one-time-off password which is valid for only a limited amount of time. This is only because the classical channels are prone to the interception and if somebody eavesdrops on the channel and steals our passwords, they can empty all our accounts! However, if the channel is secured by encrypting the password based on quantum mechanical rules, which means using single photons, then the password is transferred safely. To explain, a photon is the single particle in light. When we send a single photon to the receiver and s/he does not receive it, an eavesdropper must be in the line. In that process, single-photon or photon-number-resolving detectors are required to detect those photons. I studied these types of detector during my PhD research, and have continued now as a postdoctoral researcher on this topic. Who or what inspired you to pursue a career in quantum photonics? I was always a curious child, asking lots of “why” questions but I never knew before I attended university that I would be doing research. I discovered my love of research when I met some enthusiastic professors/researchers during my Bachelor’s at university. Then, when I started my final year project, I knew I would be definitely doing PhD because it was inspiring to be in the lab and get my hands dirty. There are also some advantages of being a researcher which are worth mentioning. Firstly, we get to meet lots of interesting, clever and inspiring people continuously. Moreover, we travel to different places for conferences/meetings and visit other research labs for work. I also believe, as opposed to some common belief, it is no different than many other jobs in the market. 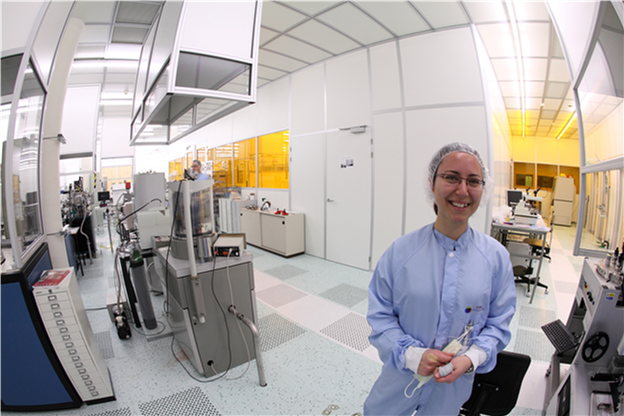 Döndü in the ‘cleanroom’: researchers must wear special, dust-free covers not to introduce particles or dust to the environment. This is Döndü’s experimental setup from her PhD. The shiny metal in the middle is the cryostat in which she did experiments using superconducting detectors. Inside the cryostat temperatures drop as low as -271 ◦C. Döndü has travelled the world with her research. 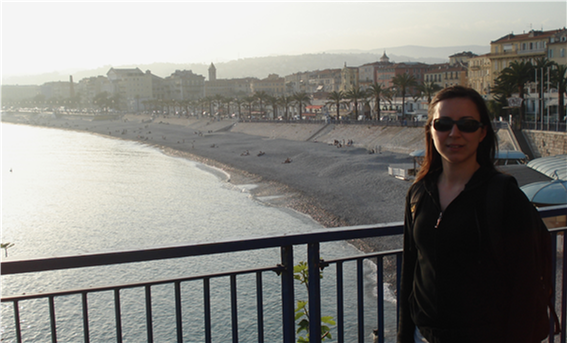 Here she is in Nice, France, taking a break from her work to discover the city. 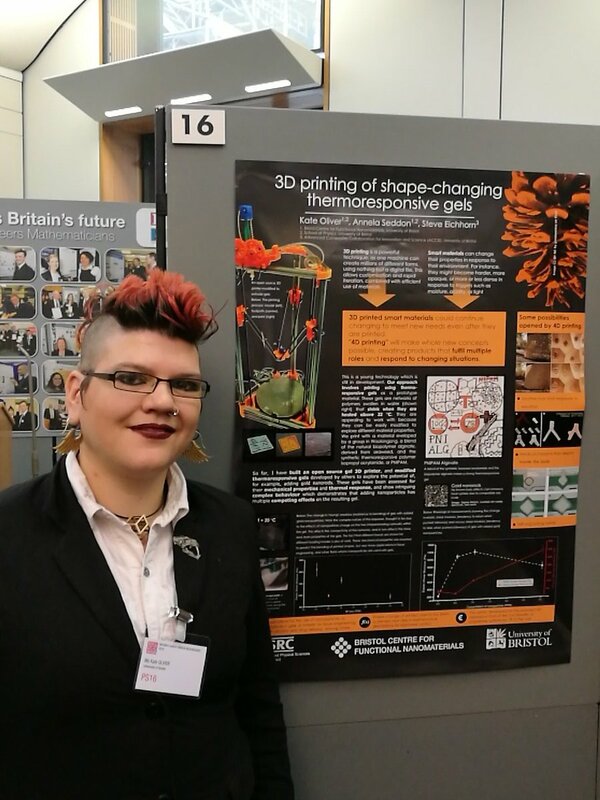 Kate Oliver is a PhD Candidate with the Bristol Centre for Functional Nanomaterials EPSRC CDT. In an extract from her own blog on Ada Lovelace Day, she discusses nanotechnology, making humans more efficient, and the motivation and inspiration for her work. I came to research nanotechnology because I wanted to build the future. I wanted to use the beautiful, isolationist physics principles I studied to understand the world to do something. We have enough problems now — global warming, antibiotic resistance, increasing population, decreasing arable land, increasing energy needs — that pretty much everything could use improving. We certainly don’t have an abundance of materials to do it with. We need to do more with less, be more clever with what we have. We should use as little material as possible, make systems that automatically save energy, design things that work based on their inherent properties. Take less, get more, be more efficient, be more adaptable, and put design into every molecule of what we do. I want life to be more like science fiction. What inspired or influenced you to pursue physics? I was torn between studying physics or going to art school. In the end I decided I could always draw in my spare time while doing physics professionally, whereas being allowed to play with particle accelerators on a casual basis was less likely. Could you tell us about your current projects? I’m building a 3D printer and developing a material for it to print that will react to changes in heat. The idea is to 3D print things that then change shape – adding a fourth dimension to printing. These smart materials could save energy and do multiple jobs. To read more about Kate’s inspiration and heroine, Professor Tomoko Ohta, read her tribute here. Professor Ohta was a great population geneticist who invented the ‘nearly neutral’ theory of genetic drift. October 13 is #ALD15, a worldwide celebration of female researchers, teachers, technicians, assistants working in Science, Technology, Engineering, Mathematics and Medicine (STEMM). To kick off our University campaign, #UoBInspired #ALD15, we at the BDC thought we should probably tell you what it’s all about! Before we begin our rollout of the inspirational women working in our own, local STEMM fields, here’s a little background on who Ada Lovelace was and what led to her status as a modern-day symbol of women working with and around technology. Ada Lovelace, the bright and mathematically-inclined daughter of the erratic poet Lord Byron, lived an intriguing, productive, and sadly short-lived life, dead from cancer by the age of 36. Her name was actually Augusta Ada King, named Countess of Lovelace after her marriage to William King, Earl of Lovelace; she is known these days mainly as Ada Lovelace. Renowned for her work with Charles Babbage on the Analytical Engine, a prototypical machine that contributed to the invention of today’s computer, Lovelace’s published a set of elaborate and thorough notes which in turn provided the inspiration for Alan Turing’s work on modern day computers in the 1940s. Her publication is still available today, simply entitled Notes, and is widely considered the first computer program. She was only 27 when the notes were published. Babbage described her mathematical powers as “higher than of any one[sic] he knew”, and despite her tempestuous and wild social life – a series of love affairs, gambling debt, and a fractured relationship with her family – she remains a powerful symbol for modern women in technology and engineering. Lovelace herself dubbed her own work “poetical science”, and her life as “a bride of science” in which she married her love of maths with her imaginative spirit. While Lovelace excelled at her career and contributed widely to her contemporary intellectual circles, her personal life was equally alluring. Estranged from her father, who died when she was eight years old, Lovelace was raised in the cloak of scandal: she was viewed as the outcome of divorce and a product of single-parenting, and associated with the allegations surrounding her father’s immoral behaviour. Famously, despite her father being at the centre of Victorian society gossip even after his death, Lovelace did not see a picture of him until her twentieth birthday, as her mother reportedly kept their family portrait covered in a green shroud. Lovelace was raised mostly by her grandmother and did not have a close relationship with her mother. Her childhood was riddled with illness, and existing correspondence suggests she suffered from a distinct lack of a maternal nurturing. Today, Lovelace’s legacy lives on in both the computers we type on and the correspondence she left behind. She was a complicated and compelling figure who traversed boundaries, as woman, scientist, daughter, mother and lover. In the vein of great scientific minds such as her famous male counterparts Albert Einstein, Carl Sagan, and even Richard Dawkins, her writings express an appreciation for the mystery and magic of science, and so of living and reality, and in this she truly represents the poetry in maths, science and technology. In a letter to her neighbor and friend Andrew Crosse she describes and champions interdiscplinarity: “The intellectual, the moral, the religious seem to me all naturally bound up and interlinked together in one great and harmonious whole… There is too much tendency to making separate and independent bundles of both the phyiscal and the moral facts of the universe”. This seems a fitting exclamation for a woman who did not like to be bundled up or boundaried herself, and who lived a contradictory life of scandal and genius in which she both broke the rules, but also set them. Read more about Ada Lovelace Day here. Join in the University of Bristol’s celebrations by tagging #UoBInspired and #ALD15. Check out the full list of events, and follow our blog throughout the day to read the stories of our own inspirational ladies in STEMM.